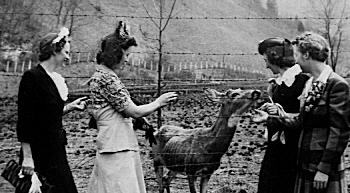 These Pike County ladies are visiting the Breaks of the Sandy area near Elkhorn City, Kentucky and have found a deer to feed. The picture was probably taken in the mid to late 1930's. If you have ancestors who lived in the area where Ky., Va., N.C., W.Va. and Tenn. come close together or touch, I hope you will find something helpful on this site. Welcome. This site is currently being created to share with others information about Eastern Kentucky families, most of whom came from Virginia. They tend to be early pioneer families who lived in Appalachian areas and began the settlement of the first frontiers. A significant number spent a time in North Carolina at some time during their journey; some lived for a while in the southwestern area of Virginia in counties such as Tazewell, Scott and Russell. A few crossed the river which separates Kentucky and West Virginia to spend some time in the West Virginia mountains. And a handful enjoyed a brief stint in the hills of Tennessee. 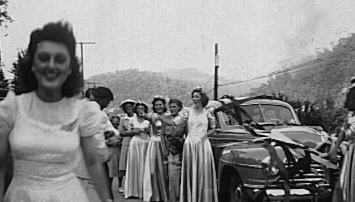 The picture above shows a wedding in Pike County, Kentucky in the 1940's. The material on this site is the result of over two years of occasional research It involved trips to libraries and courthouses, looking at family records and mementos, public records of the relevant states, and a multitude of books and web sites. After all that is said, nevertheless, it was done by a beginning amateur genealogist (me!) and no claims of absolute accuracy are made. Care has been taken to try to get it all "right" but readers are encouraged to simply use these pages for leads and do their own research. Genealogical material on these pages is not intended for commercial use by visitors and may not be distributed to others without the appropriate permissions. This site is hosted by Tripod. However, we eventually plan to add an index in the back with all surnames. Our site was started in mid-December so almost everything is new! We are currently working on increasing the number of family listings. Our next project will be adding lots of web site listings to help in your research (if our counties are similar to yours) and adding some variety with photos, etc. Thanks for your patience with our little hobby genealogy site. Your suggestions are welcome. 1. You link up with others who are researching in the same areas. Rootsweb county sites and local genealogy clubs and libraries in the areas inhabited by your ancestors are particularly helpful. 2. You learn its geography and history. Get a good map of the state on which you are focusing. (It may even have some small towns or streams named for your ancestors!) Be aware that county boundaries have changed over a period of time, with new smaller counties being split off big, old ones. This information can be helpful. There is a book called Map Guide to the U.S. Federal Censuses by William Thorndale and William Dollarhide (Genealogical Publishing Co., Baltimore)which is useful but this type of information can often be found on the Internet or in other printed materials as well.